Barrio Lastarria is a tourist gem in otherwise stodgy Santiago. The tiny neighborhood boasts some gorgeous restaurants, scenic parks, a famous museum, and an arts and crafts market on the weekends. So if you’re traveling to Santiago, make sure you follow this guide to find the best bits of this charming neighborhood. Beginning at the intersection of Estados Unidos and Merced, you'll see beautiful Parque Forestal. It stretches for about 5 blocks, and contains the Museo Nacional de Bellas Artes. Although it’s flanked by heavy traffic on either side, it’s surprisingly serene on most days. If you’re there on a Sunday, make sure you take some time to stroll through the tree-lined pedestrian path, watching couples canoodling on the lawn or active Santiguinos taking advantage of the closed off road for biking and running. 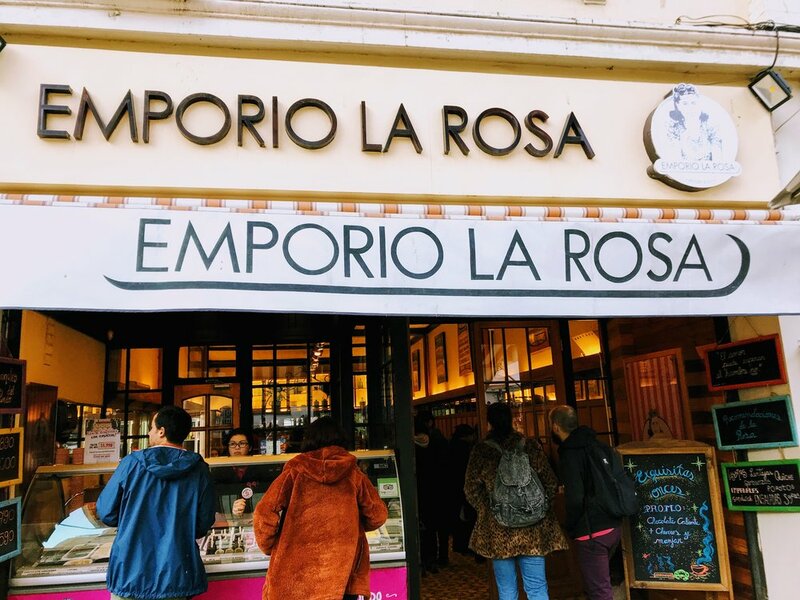 Emporio la Rosa - this famous ice cream place is an institution in the city, with good reason. While it has several locations sprinkled throughout the city and even one in Valparaiso, the one on Jose Victorino Lastarria has a pretty view of the park and outdoor seating. I’ve tried several chocolate flavors, and can personally attest to their quality. Pick up a cup on your way through the park. Walking west on Merced, you'll see a beautiful building called the Camara Nacional de comercio Servicios y Turismo de Chile (National Chamber of Commerce Services and Tourism of Chile). The real name you need to remember though, is Palacio Bruna, a stately landmark that I got to visit during Chile’s Dia del Patrimonio in May 2018. This stunning building used to house the embassy of the United States until 2014, when it was turned over to the Tourism office. While you can't go inside, it's absolutely worth making a stop to snap some photos and marvel at the architecture. 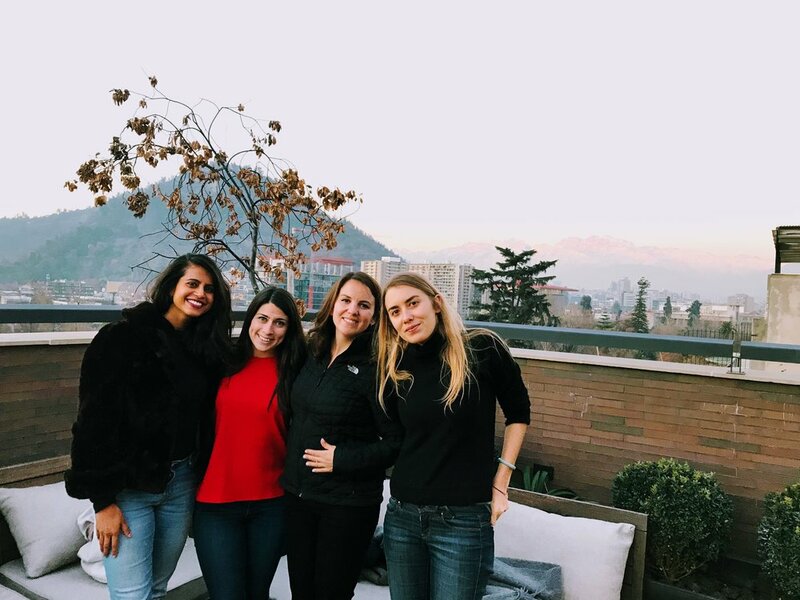 The Singular Hotel is a popular rooftop bar with a breathtaking view of the Andes mountains, best seen during sunset over a glass of wine and good company. The prices are, as expected, slightly higher than most places, but the service is outstanding and Instagram opportunities are aplenty. Within a few steps, you'll arrive at an important intersection...Merced y Jose Victorino Lastarria. On weekends, it’s buzzing with activity - from the artisan market that sells jewelry, artwork, books and even special "magic cookies" (will let you figure out what those are). But what you’re really here for is to choose from the innumerable restaurants that make up this cobblestoned street. It’s no secret that Chile is famous for its wineries, but visiting Bocanariz is a great introduction to its wine scene. The knowledgeable sommeliers will be happy to assist you in picking a glass of wine from their extensive menu, or you can imbibe in a tasting while sampling their culinary delights. Chepe Libre is another Santiago institution, owned by the same owners as Bocanariz. Its specialty, however, lies in their unrelenting focus on pisco. Make sure to try a pisco sour, or opt for a tasting and learn about Chile’s successful pisco industry. While Liguria’s exterior architecture is nothing short of spectacular, they are also well known for serving delectable Chilean cuisine. If you’re interested in trying out the local food, this is the place to do it. They also have pretty great wines to accompany your meal. After all that rich food, work off the calories with a short urban hike to Santa Lucia. This beautiful fort sits in the center of the city and serves as a reminder to Santiago’s past. A few minutes of steep stairs will take you to the top, where you’ll be rewarded with sweeping views of the city (barring any pollution, of course). Don’t miss the chance to indulge in some selfies - your Instagram followers will thank you for it. CHECK OUT THESE POSTS BELOW!